A stunning new image from NASA's Hubble Space Telescope shows countless stars being born in a nearby dwarf galaxy. 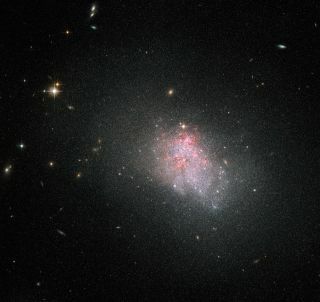 The Hubble photo depicts the faint irregular galaxy NGC 3738, which is located about 12 million light-years from Earth in the constellation Ursa Major (The Great Bear). NGC 3738 is undergoing a violent episode of star formation, converting huge clouds of hydrogen gas — which glow red in the image — into new stars. NGC 3738 is a type of galaxy known as a blue compact dwarf, researchers said. Unlike elliptical galaxies or spirals, blue compact dwarfs tend to be chaotic in appearance, lacking distinctive features such as central bulges or spiral arms. They're thought to resemble some of the universe's earliest galaxies and could provide clues about how stars looked shortly after the Big Bang, researchers said. Blue compact dwarfs, which get their color from large clusters of massive, hot-burning stars, also tend to be much smaller than many other types of galaxies. Indeed, NGC 3738 is 10,000 light-years across — just one-tenth the size of our own spiral Milky Way. The new photo was generated by combining visual and infrared images taken with the Wide Field Channel of the Advanced Camera for Surveys aboard the Hubble Space Telescope. The Wide Field Channel's field of view is approximately 3.4 by 3.4 arcminutes wide, researchers said. Hubble is a joint operation of NASA and the European Space Agency. The telescope has made more than 1 million science observations since its April 1990 launch, and it's still going strong.